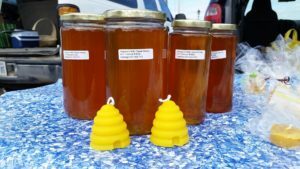 Good news from Howson’s Pure Maple Syrup and Honey this week. 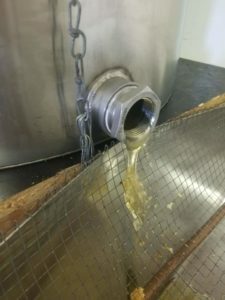 The first honey harvest of 2018 is underway! 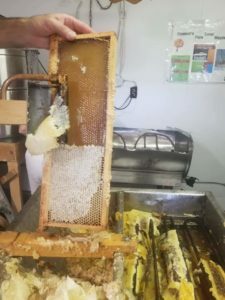 Check out Howson’s Facebook Page for photos and video of the capping wax being taken off the frames and the honey dripping out of the extractor. It looks so good! My sons like honey drizzled on their cereal in the morning and I’ve learned not to buy any honey but Howson’s. My boys won’t eat it. They’re spoiled on the good stuff! If you’ve never given Howson’s honey products a try, be sure to stop by and see Wayne (or his son Will) on Wednesdays and Saturdays. Wayne often has beeswax and beeswax candles for sale as well as their delicious maple syrup of course! All the usual goodies at market on Wednesday – beef, lamb, soap, honey, maple syrup, homemade sushi and pastries. Our produce vendors have beans, cucumbers, zucchini, garlic and new potatoes coming on strong. 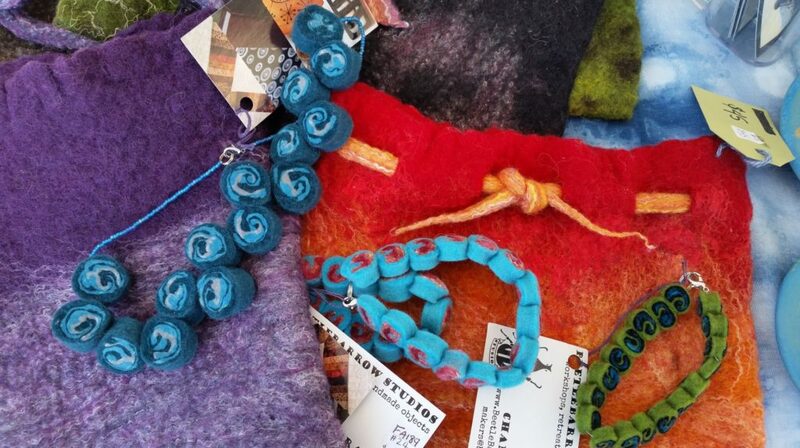 Chandra Rice is back with her fabulous pottery, textiles, hand bound books and more! Did you know that Chandra offers creative retreats with BeetleBarrow Studios at The Cedars near Campbellford? For more information about how to join her for a weekend away, visit BeetleBarrow’s website. 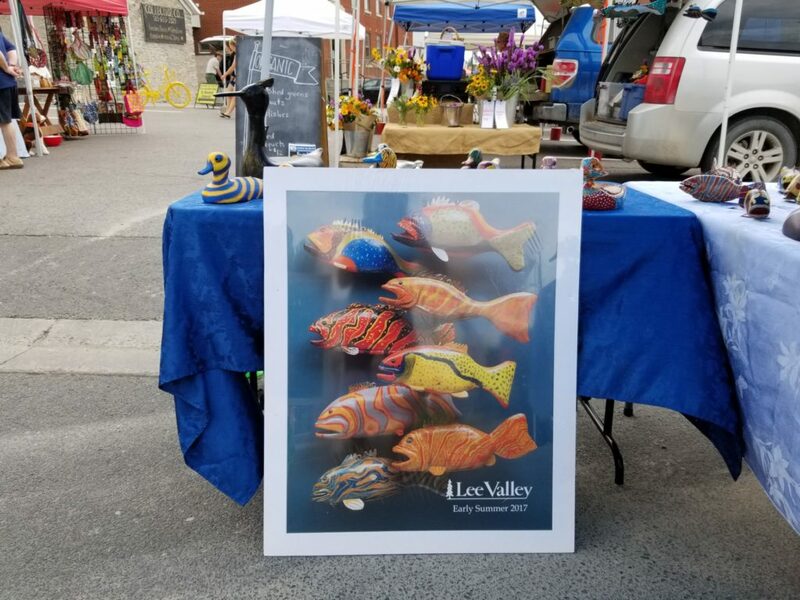 Ken Dummit and his sister Annita, are bringing Ken’s hand carved fish and ducks for sale. Ken’s Rush Point Carving has been featured on the cover of Lee Valley catalogues! Quite an honour! Davis Woodworks will be here too. Alec Davis’ woodworking is always a hit. 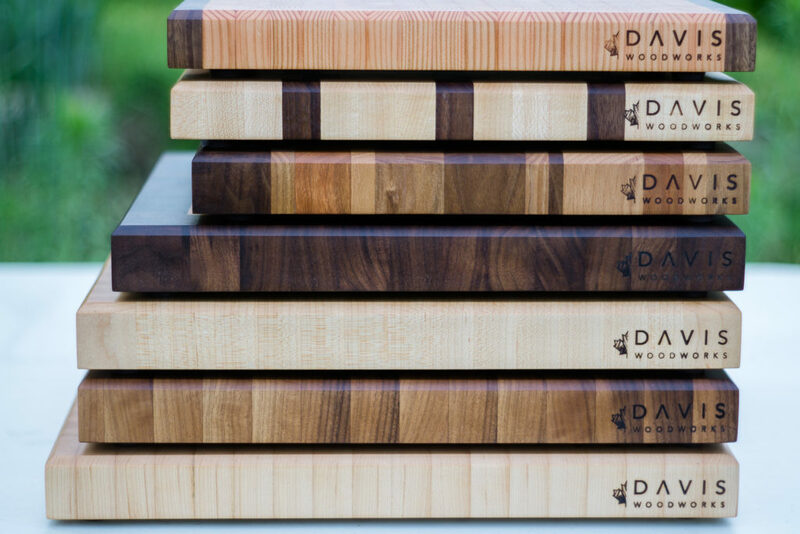 His cutting boards, bowls, rolling pins and more, are works of art that make wonderful wedding or house warming gifts. And we look forward to hearing the talented musician Jessamyn Pedersen perform for us! Our gardens are really starting to produce now. For local food enthusiasts, it’s a great time of year to start thinking about preserving the harvest. Braelea Acres posted a tutorial on their Facebook Page this week about how they prepare beans for the freezer. What a treat mid-winter to enjoy local produce for dinner! “We love giving our customers the freshest produce possible at market. Sometimes we have left-overs or the produce needs to be picked in between market days. When this happens, we save it for our winter supply. 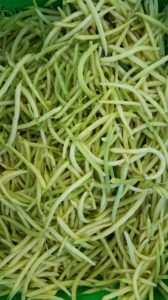 1.Wash beans, remove stems and snap into desired size. 2. Blanch the beans in boiling water for 1 minute. I use a pot with a strainer insert. 3. Rinse/plunge beans in cold water. This stops the cooking process. 4. Spread blanched beans on a clean towel and let dry for a few minutes. A fan can help with this. 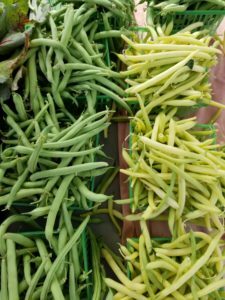 The next time you see lots of beans at market, buy more than you need that week and give it a try! Some of our vendors do the work of preserving the harvest for you. 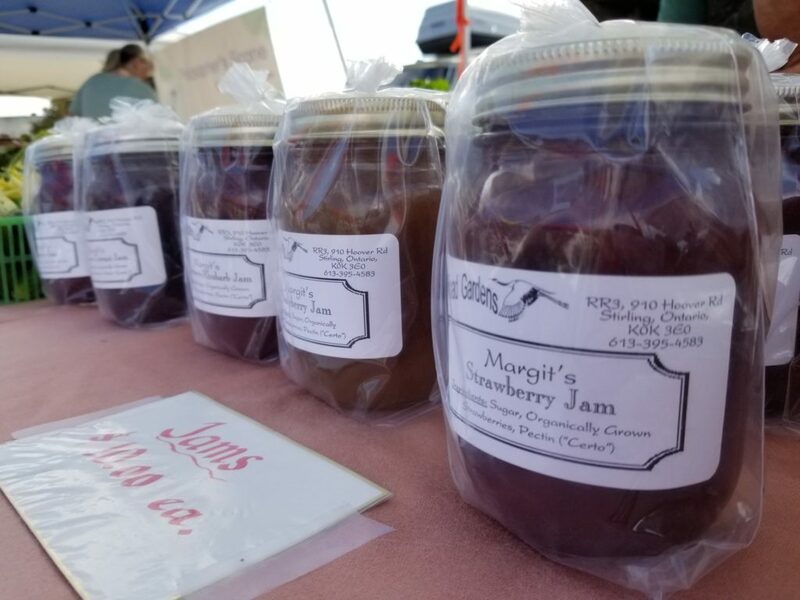 If you haven’t already tried Margit’s jams at Lost Road Gardens table – be sure to give them a try! All the berries that Margit uses come from her and Ivar’s gardens. Another favourite preservation method of our vendors is dehydration. When work in the greenhouse winds down, Amanda and Frank of Rainbow Terrace focus their energies on their fantastic garlic crop. 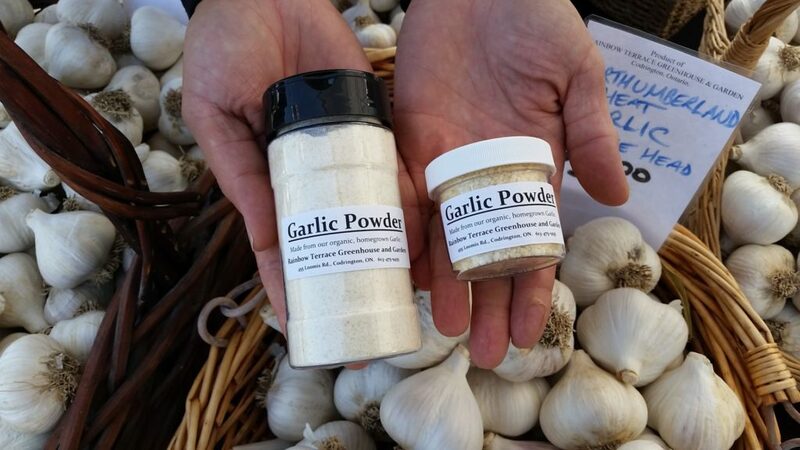 Their dehydrated garlic powder is a must-have for your kitchen! Unlike the tasteless yellow powder we’re used to, Rainbow Terrace’s garlic powder is so flavourful you’ll wonder why you ever go to the trouble of peeling fresh cloves! Amanda is already hard at work dehydrating some of this year’s crop. Make sure to scoop some up when you see it! And finally, baked goods! You can preserve the harvest in your baking too. Zucchini loaf, pumpkin muffins, and fresh berry pies all freeze well. 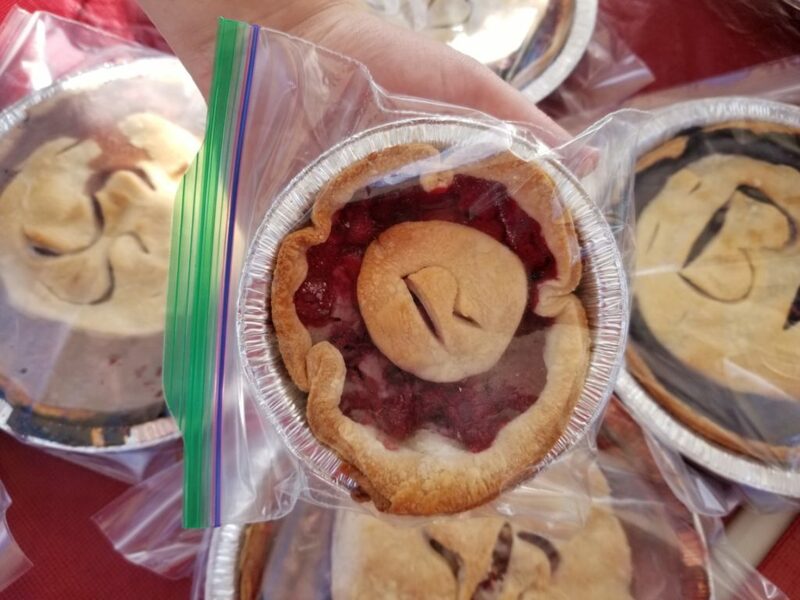 Although if you buy pies from Ashley at A2 Baking Creations (all made with real fruit, no pie filling), it’s highly unlikely that they’d last long enough to make it to your freezer! I love these mini pies that she makes. They’re perfect for one or two people. Watch for artisan Lissa Clement of Grey Willow – jewelry, candles, soap and more! We’re joined by artisans Art de Claude, White Pine Wood Creations, Northern Life Soap, and Lone Elm. 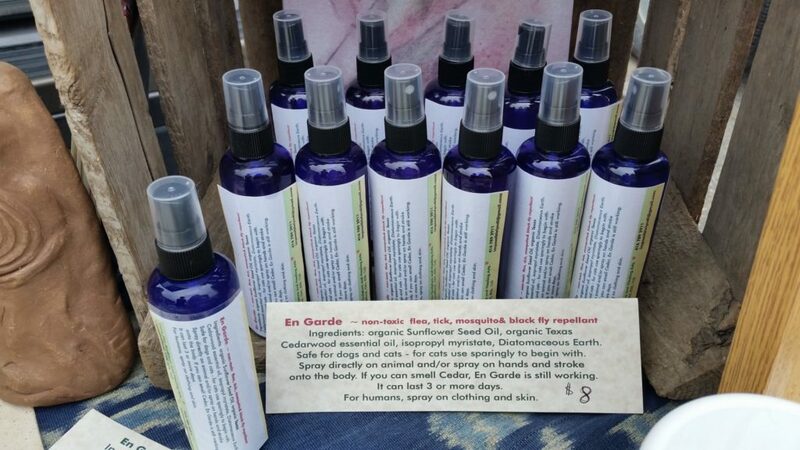 Did you try Lone Elm’s fabulous natural insect repellent? We need all the help with tick prevention this year that can get! Musician Cheryl Casselman was one of our favourite guest musicians last year. We’re really excited to welcome her back for a performance! Thanks for reading. See you at the market! 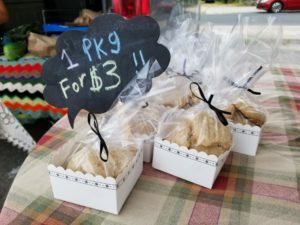 Farmers’ markets are great places for children to think about where their food comes from, connect with people in their community, and develop a lifelong interest in cooking. We love to see children at the market! This Saturday July 28th we’re holding our annual Family Day at the Market event. We hope that you gather up the youngsters in your life and join us for a morning of fun starting at 8am! 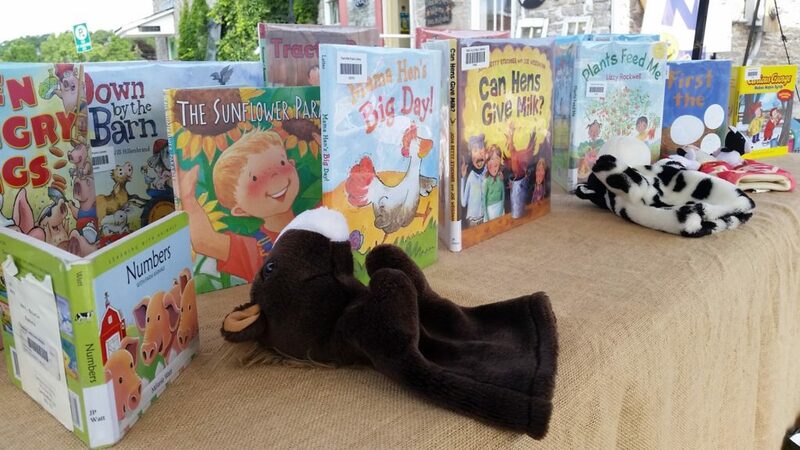 The Campbellford Branch of the Trent Hills Public Library will be joining us with books about farming and food from their children’s book collection. Stop by for a browse or a story! They’ll also have some fun crafts to make. The Early On Child and Family Centre will be at the market too! Another tremendous free resource in our community for families. If you aren’t aware of their services, come and check out their display! They’ll be bringing lots of activities for kids to do too! 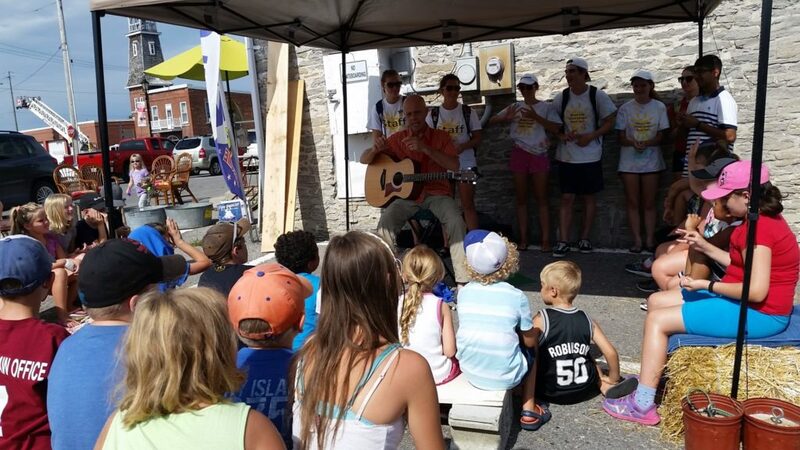 Local musician Terry Brooks will lead us in a knee slapping, toe tapping, sing-a-long! You might know Terry from the Brighton Library. Terry loves to sing, but he doesn’t like singing alone! Come ready to join in the musical fun at 10 am. We’ll also be setting up our popular, one of a kind, market vendor play station. 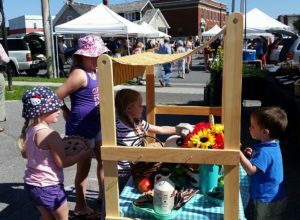 Children will have fun flexing their imaginative play muscles by using the small market stall, baskets, and toy food to pretend to be farmers’ market vendors. We’ve designed a market scavenger hunt for children to try. Complete the hunt and win a homemade shortbread cookie from Wholesome Breads by Erin. Yum yum! 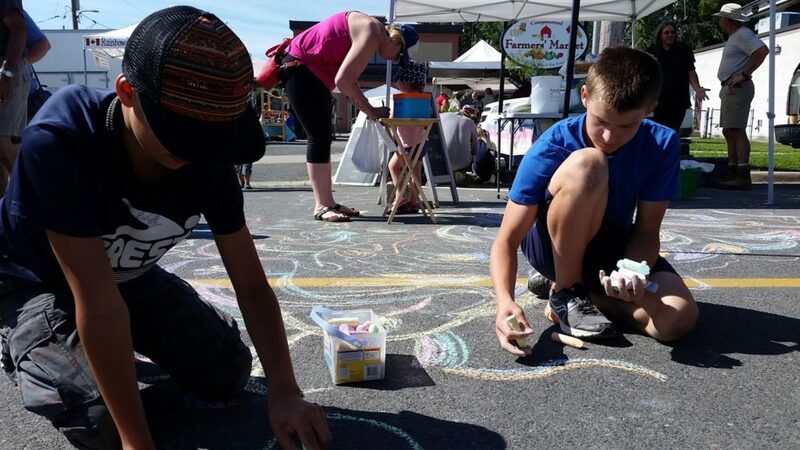 And we’ll need help to decorate the market with chalk art! Grab some chalk and help us bring some colour to the concrete. 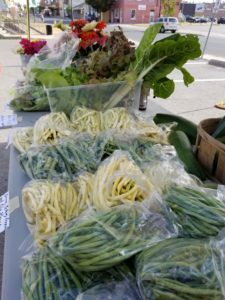 As always you’ll also find the best of fresh local produce, meats, honey, maple syrup, preserves, and baked goods at the market. Our three artisans this Saturday are Studio Grace, Chandra Rice, and Art de Claude. Claude’s been working on some wooden whistles and toy tops especially for Family Day. I can’t wait to see them! Thanks for reading and we’ll see you on Wednesday and Saturday! It’s difficult to summon up the energy to cook in this hot summer weather. On these really hot days I’m also hesitant to heat up the house with the oven. But don’t worry! We’ve got lots of options at the market to streamline your summer cooking, and get you out of the kitchen and back out into summer fun! Melly Rolls has coolers full of easy summer eating. 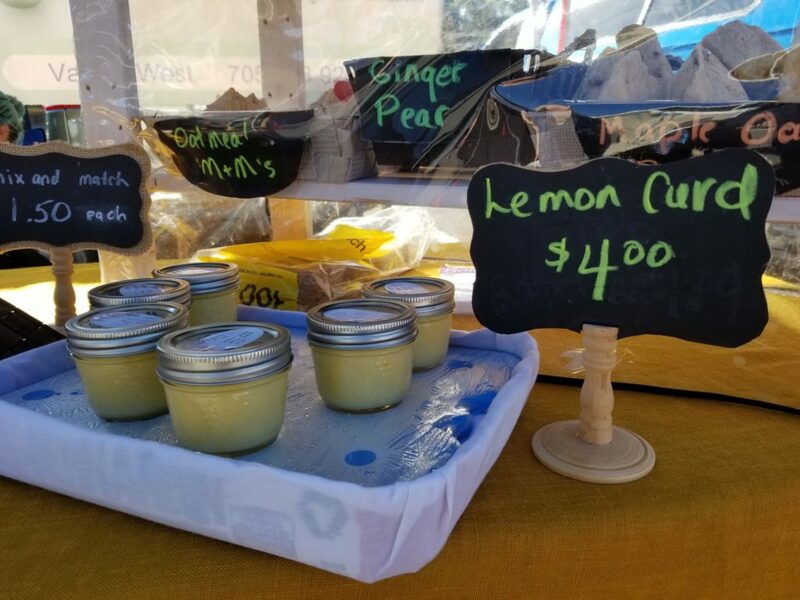 Melissa comes to Wednesday and Saturday markets and has lots of prepared food options – nutritious and for your sweet tooth! 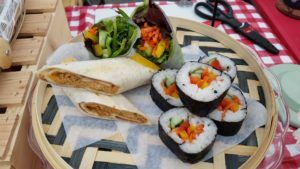 Her sushi rolls are really popular, and come in a range of different flavour combinations. It’s the perfect choice for a picnic! The classic summer dinner choice is, of course, the barbeque, and our meat vendors always come with premium cuts for your grill. Russett Farms is the place to go for beef. Sandra’s happy to help you pick out the perfect steak. 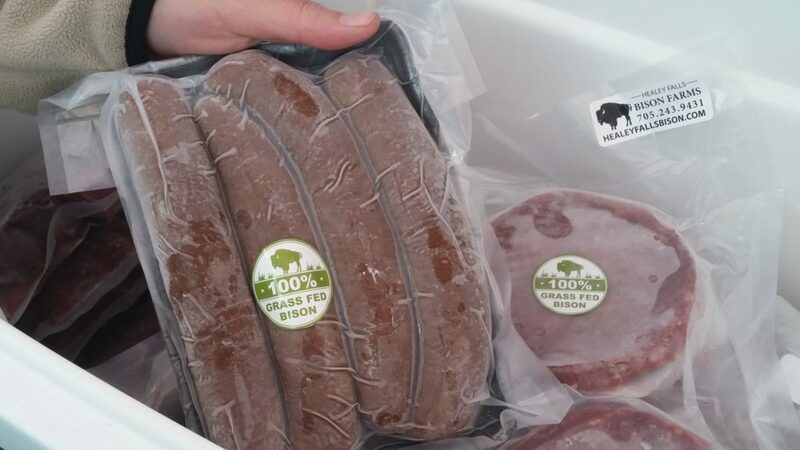 Did you visit our Saturday vendor Healey Falls Bison Farms at the Incredible Edibles Festival last weekend? They were at the festival serving pulled bison on a bun. By the look of the long line up at their table I’d say it was a hit! If you’ve got a slow cooker it’s actually a great place to cook your summer meals too. Slow cookers create a lot less heat than a big oven does and with a bit of work in the morning, dinner will be ready for you when you get home from your day at the beach! Healey Falls Bison Farms will be back vending with us on Saturday – you can ask Wendelin how she prepares their slow cooked bison. Their burger patties and sausages are also easy summer meal options. Sometimes all you can muster is a piece of toast. That’s okay too! Especially if you’re toasting super nutritious bread like you can find at Wholesome Breads by Erin. Erin uses the best of ingredients, including local organically grown flour. She has several kinds of bread to chose from. Erin’s children have also been busy in the kitchen. 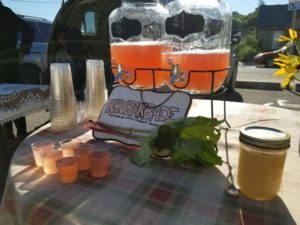 Be sure to check out Zen’s shortbread cookies and Takeo’s Rhubarbade! Lost Road Gardens will be back vending with us regularly on Wednesdays (as well as Saturdays). 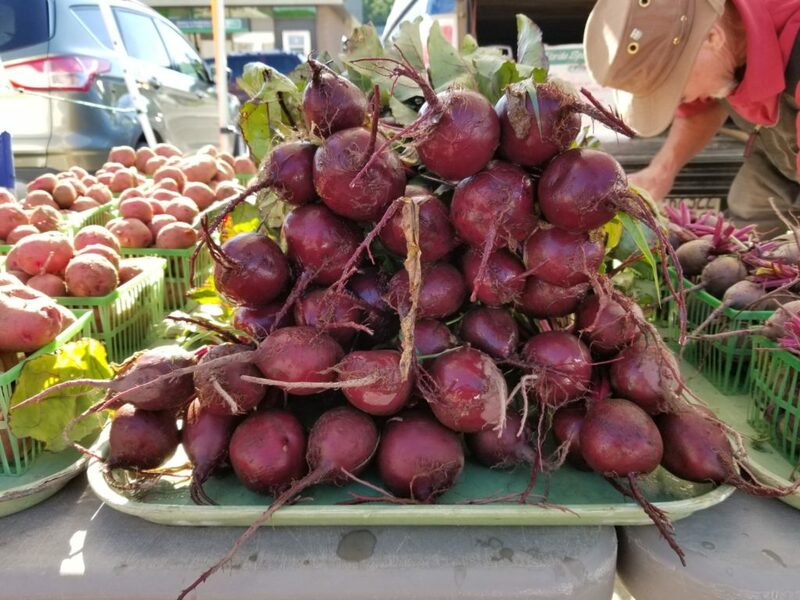 This Wednesday Ivar hopes to bring beets, potatoes, beans, and maybe cucumbers. He’ll also have some of Margit’s delicious raspberry jam! We’re also joined by artisans Grey Willow and Sign Design. Treat yourself to something handcrafted! Three artisans are scheduled to come this Saturday: Davis Woodworks, Relatively Rustic, and Studio Grace. Click on the their names to see their vendor profile pages and learn more about who they are and what they do. Multi-talented local musician Ivan Stille will be performing for us in the white tent. Thanks for reading, stay cool, and we’ll see this week! After last week’s heat wave we’re starting to see new things at the market. 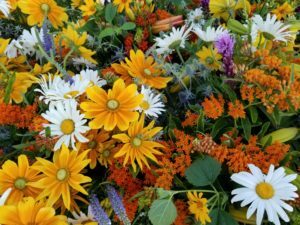 Last Saturday the cut flowers in Glenlea Farm’s bouquets were the vibrant yellows and oranges of summer. At Vokes Farms, you could have your choice of red or white skinned new potatoes. 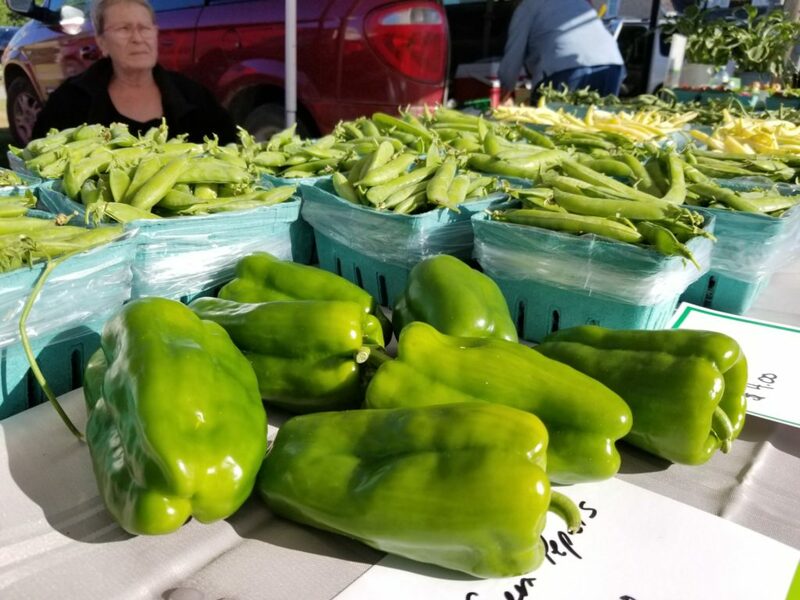 And new produce vendor Zajac Gardens, had a table full of peas, beans, zucchini and peppers! Braelea Acres will have their usual coolers full of delicious organically grown lamb and pork. Also look for peas, zucchini, baby beets and likely the last of their rhubarb. Make sure your freezer is stocked for winter rhubarb baking! Ken from Alton Farms is back! On Wednesday he’s bringing beans, leaf and mix lettuce, and radishes. It’s the Incredible Edibles Festival weekend! The festival has a terrific slogan – “If you eat, you’re in!” What a great reminder that food is an equalizer. It’s something that we all share. It’s so nice to see the spotlight that the festival shines on our community and local food. We appreciate all the work that the organizers put into making the day fabulous. A few of our vendors will be joining the festival for the day, but the rest of us will be set up as usual from 8 am until noon, enjoying local food with you in our own way. What a fun day it’ll be! 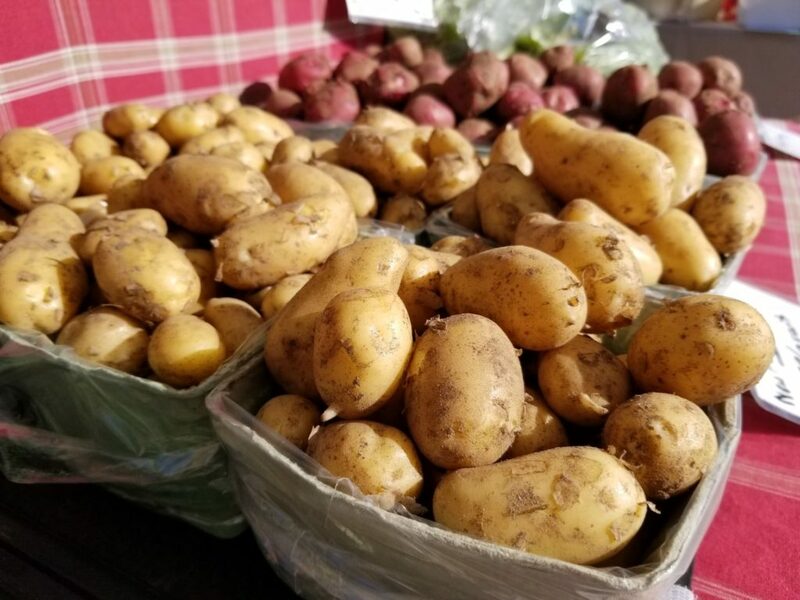 Don’t forget to look for more new potatoes at Vokes Farms. New potatoes hardly need any preparation at all – they just melt in your mouth! 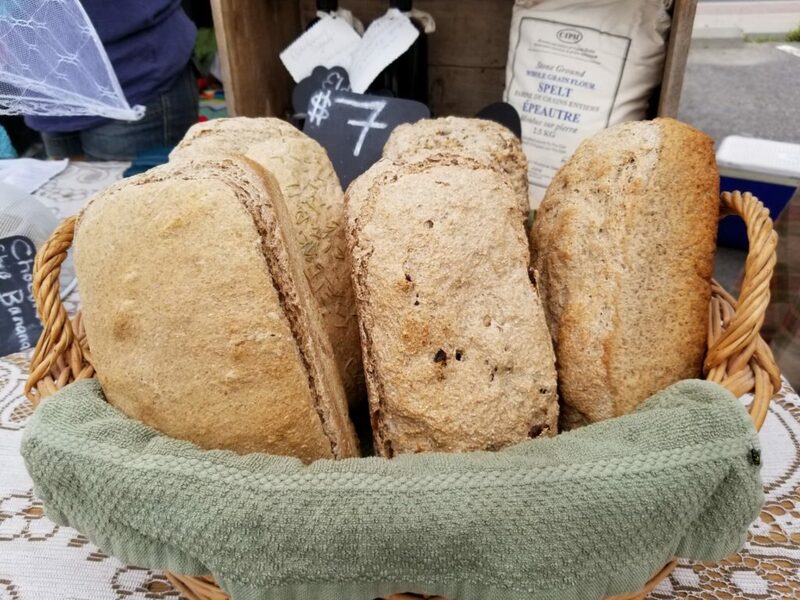 Also, Val at The Philosopher’s Scone will be serving up a special treat at the market on Saturday morning – food festival style! For $3.00 she’ll have one of her orange scones topped with her *to die for* homemade lemon curd and whipped cream. Trust me – it’s worth coming to market just to try this!! We’ll also be joined by talented artisans Ken’s Rush Point Carving, Grey Willow, and Art de Claude. I wonder what they’ll bring this week! Ean McMillan and Eleanor Belanger are back to perform their music for us. If anyone knows how to liven up our Saturdays, it’s Ean and Eleanor! Thanks for reading, and we’ll look for you at the market! One could think that nothing is easier than growing carrots. All that is needed is a well-prepared, soft bed of soil, a quarter pound of carrot seeds, and one of those precision seeders (which may or may not work the way you expect them to do). Since carrot seeds are frost hardy, you pick one of those warm days in April to run the seeder along a strung-out line and 3 months later you will be harvesting beautiful juicy sweet carrots by the bunches. With some luck you will also be the first at the market with that crop, and the customers will line up at your stall to get your carrots. It does not quite work out this way, at least not for me. I have yet to find a seed catalogue, or even one of those lavishly illustrated gardeners’ how-to books which inform you that your 2000 carrot seeds have to compete with tens of thousands of weed seeds in that nicely tilled and fertilized row. 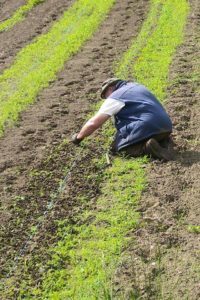 It takes about three weeks for the carrot seeds to germinate which gives you plenty of time to concentrate on other tilling/sowing/weeding/planting priorities. However, if after 2 weeks you take a casual glance at the carrot row you discover to your great delight that pretty green ribbon stretching along the 160 feet carrot row, and you congratulate yourself on your superior gardening skills. The elation does not last long when, at closer inspection you find that the green ribbon consists of quack grass, thistles, pigweed, bindweed, and lambs quarters with a few tiny carrot seedling (which look like weeds anyway) barely visible. The problem is that the weeds grow at an alarming rate. So, if you want to take early carrots to the market, your priorities will change in an instant: forget everything else and pull out the weeds before they choke the carrots for good. I must admit that I have lost more carrot crops than any other vegetable to weeds. This year I have made a resolution to let no weeds interfere with my carrots, mainly because the seed company sells them no longer by weight but counted. I did not bother to check whether the small package really contained 10,000 seeds, but it was very little. Therefore it was imperative that every single seed would turn out to be a marketable carrot. I calibrated the seeder to the exact depth and rototilled as deeply as possible. Then I loaded the seeder, and off we went down the 160 feet row marked by binder twine. Well, it was still early in the spring, the soil was a bit sticky, and a cold wind blew from the west. It was hard enough to push the seeder through the wet soil, a few rocks made the seeder jump, and then a sudden gust of wind pushed me off course. That was it for a straight row, but I convinced myself that this did not matter. The weather turned nasty, so muddy that walking on cultivated soil was not possible. It took two weeks before I could check on the progress in the carrot row, and sure enough it had turned into a green ribbon consisting of the aforementioned quack grass, pigweed, lambs quarters, bindweed, and thistles, but no carrots. They showed up one week later, tiny, barely recognizable, irregularly spaced, and sometimes a foot away from the designated line. As miserable as the row looked, the carrots had to be salvaged, a.s.a.p. I started early in the morning. It promised to be a nice day with a gentle cool breeze and not too many blackflies. I went down on my knees getting my face as close as possible to the ground so that I could see the difference between quack grass and carrot seedlings, wondering how the hell I was going to make it through a few hours in that position. The un-informed passerby, however, might have mistaken me for a deeply religious person, kneeling down in a prayer of thanksgiving. Work proceeded quite nicely, although I had a few problems with figuring out which way the row went. Then I heard this squealing sound, reminding me of a whining baby coming towards me. The mosquitoes had arrived looking for tender feeding spots like my ears and my eyes. I swore loudly, not shying away from profanity, and slapped my head to kill the bloodthirsty insects. The un-informed passerby, however might have mistaken me for a repentant sinner castigating himself. After two hours only twenty feet of weeding needed to be dealt with. My knees hurt, I was tired, sweaty, hungry, and thirsty, but still determined to finish the job. 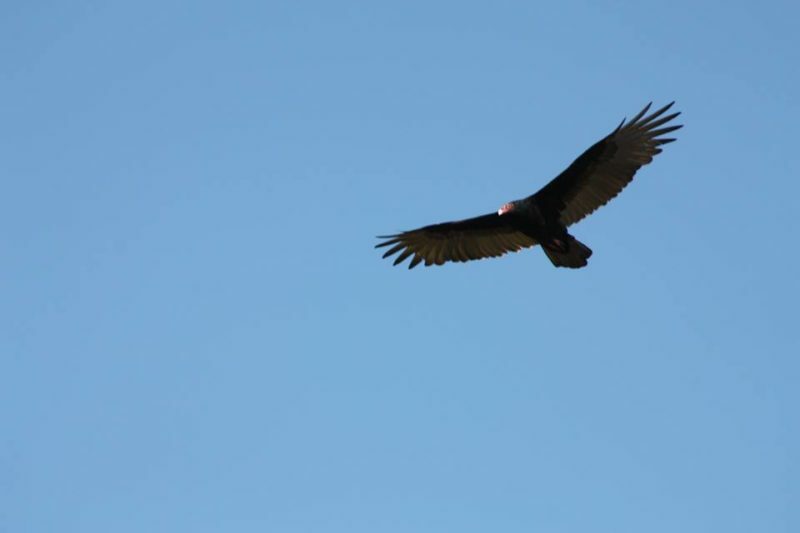 Suddenly three turkey vultures started to circle above me. They are known for their fine sense of smell, steadily on the lookout for dead meat of any kind. Since weeding of carrot seedlings is an extremely slow job, they must have gotten the idea that this motionless body down there could possibly be lunch for them. Being beyond the age of 65 it is a good idea to check my vital signs from time to time. It was quite a relief that I could feel my pulse. Then it dawned on me that I had attracted the vultures with my smell. Immediately I called it a day, had a good shower, a beer, lunch, and the obligatory snooze. There is now a twenty foot stretch of very tall weeds left in the 160 foot carrot row, but I survived. That should count for something, I suppose. Sign up and we'll regularly email you with market news.